Samir Nasri has returned to English football for the first time since playing for Manchester City, reuniting with Manuel Pellegrini and Pablo Zabaleta at West Ham. 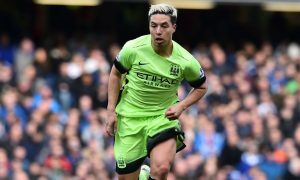 Nasri’s 12-month doping ban has come to an end, allowing him to join the Hammers, with whom he has been training for some time and has earned a contract with. The former French international won two Premier League titles with City, the first in the Roberto Mancini era on that famous day in 2012 against QPR, and the second under his new boss Pellegrini in the 2013/14 season. When Pep Guardiola arrived, Nasri’s time as a City player was practically over and he spent the 2016/17 season on loan at Sevilla before making a short-lived move to Turkish side Antalyaspor in the summer of 2017. Pellegrini made reference to having worked with Samir before when welcoming the 31-year-old. Nasri himself sounded delightful about returning to English football.